Quebec, January 22, 2019 – In reaction to the Canadian Coast Guard’s emergency response to maintain adequate icebreaking services on the St. Lawrence, the marine industry urges the federal government to supply the Canadian Coast Guard with sufficient icebreakers necessary to keep the navigation channel in operation at all times and to ensure the safety of concerned communities. Earlier today, the Canadian Coast Guard was forced to close down the navigation channel because an ice jam has built up over a distance of 8 miles near Île des Barques in the Lake Saint-Pierre, suspending several domestic and international ships’ operations. In order to break up the ice jam which has already caused a rise in water level of 25 centimeters near Contrecoeur, the Coast Guard had to call on three icebreakers that were engaged in other regions of Quebec (Amundsen, Martha L. Black and Paul Radisson). The current situation occurred despite the predictable weather conditions because a lack of icebreakers forces the Coast Guard to be reactive, rather than being proactive, putting at risk public safety and harming the economy. The icebreakers that were rushed to the scene had to leave behind other locations where their service is also vital. 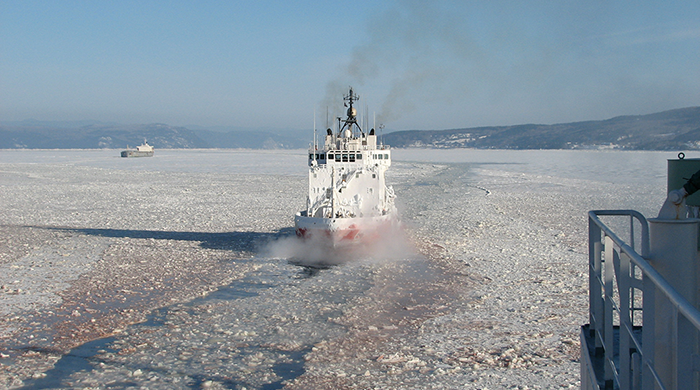 ‘In the case of a similar situation occurring elsewhere in Quebec, we are entitled to question whether the Coast Guard is capable of taking action and handling two incidents simultaneously, given the time it takes to relocate the icebreakers.’ said Nicole Trépanier, CEO of the St. Lawrence Economic Development Council. In order to sustain our economy, it is both crucial and critical to provide the Coast Guard with new and powerful state-of-the-art icebreakers necessary to deliver the level of service it has committed to by agreement with the industry. The federal government must take action now. It is a matter of public safety due to the risk of flooding and uncontrolled disruption of the ice jam. The St. Lawrence Economic Development Council (SODES) plays a key role in economic activity related to the St. Lawrence River. It is the voice of the maritime community, representing its interests and projects in all forums and before all authorities where our economic future is at stake. With its many members from all walks of life, SODES works to promote the development of the St. Lawrence River in keeping with sustainable development principles. St.Lawrence Shipoperators’s mission is to support its members’ growth and the development of shipping on the St. Lawrence by representing and promoting Canadian ship owners’ and operators’ activities.